HomeEnglishGëzuar 4 korrikun ditën e Pavarësisë dhe ditën e lindjes së ShBA! Gëzuar 4 korrikun ditën e Pavarësisë dhe ditën e lindjes së ShBA! 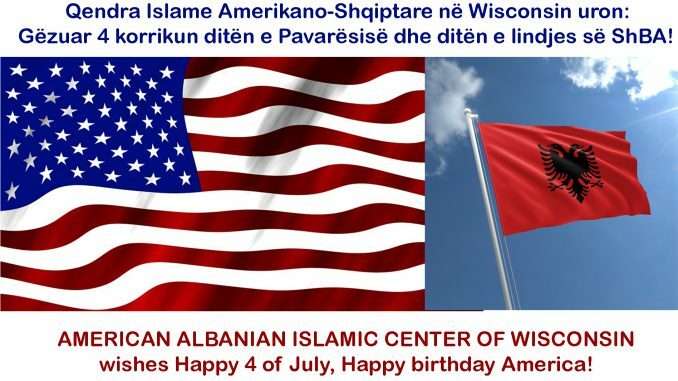 AMERICAN ALBANIAN ISLAMIC CENTER OF WISCONSIN wishes Happy 4 of July, Happy birthday America! “Fourth of July” and “4th of July” redirect here. For the date, see July 4. For other uses, see Independence Day (disambiguation). For other related material, see Fourth of July (disambiguation). Adams’s prediction was off by two days. From the outset, Americans celebrated independence on July 4, the date shown on the much-publicized Declaration of Independence, rather than on July 2, the date the resolution of independence was approved in a closed session of Congress. Historians have long disputed whether members of Congress signed the Declaration of Independence on July 4, even though Thomas Jefferson, John Adams, and Benjamin Franklin all later wrote that they had signed it on that day. Most historians have concluded that the Declaration was signed nearly a month after its adoption, on August 2, 1776, and not on July 4 as is commonly believed. Coincidentally, both John Adams and Thomas Jefferson, the only signers of the Declaration of Independence later to serve as Presidents of the United States, died on the same day: July 4, 1826, which was the 50th anniversary of the Declaration. Although not a signer of the Declaration of Independence, James Monroe, another Founding Father who was elected as President, also died on July 4, 1831. He was the third President who died on the anniversary of independence. Calvin Coolidge, the 30th President, was born on July 4, 1872; so far he is the only U.S. President to have been born on Independence Day. In 1777, thirteen gunshots were fired in salute, once at morning and once again as evening fell, on July 4 in Bristol, Rhode Island. Philadelphia celebrated the first anniversary in a manner a modern American would find familiar: an official dinner for the Continental Congress, toasts, 13-gun salutes, speeches, prayers, music, parades, troop reviews, and fireworks. Ships in port were decked with red, white, and blue bunting. In 1778, from his headquarters at Ross Hall, near New Brunswick, New Jersey, General George Washington marked July 4 with a double ration of rum for his soldiers and an artillery salute (feu de joie). Across the Atlantic Ocean, Ambassadors John Adams and Benjamin Franklin held a dinner for their fellow Americans in Paris, France. GËZUAR SHQIPTARË 11 VJETORIN E PAVARËSISË SË KOSOVËS! Me zemër të mirë muajin e begatë të Ramazanit!